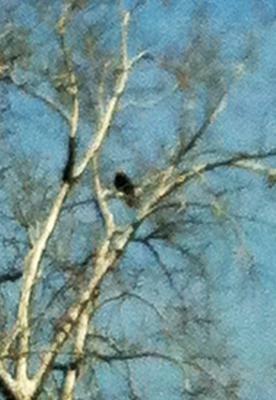 I was driving home at 9:30 am on February 4 2014, when I spotted a huge Bald Eagle in the tree along side highway 37. 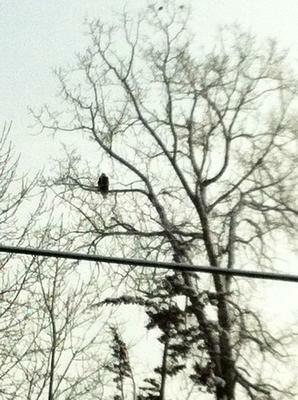 I stopped to watch for a while and hoped he would fly so I could be sure it was indeed a Bald Eagle! His head turned as he watched me watching him. I was travelling down hwy 28 just outside of Woodview, Ontario. The first thing I saw was this bright yellow coming toward me then I saw it's white head. I had to pull over I was so excited. I've seen them in the States but never here in Canada. I've been watching the skies ever since hoping to catch another sighting. Since I was a young child I have been in awe at the sight of any bird of prey. I was fortunate enough to see and hear many Red Tail Hawk's in Malton 34 years ago. I was driving with the family approximately 3 weeks ago, in the Thomasburg (Tweed) area, when I spotted 2 very large soaring birds. I could tell they were not Osprey, or a Turkey Vulture (there are many in the area). As I got closer I did not recognize them to be a hawk. I did see a photo taken of a Bald Eagle sighting in the Stirling area last year. So I though maybe they were Eaglets, as they were much larger and soared differently than any Hawk I have ever observed. There underside matched the characteristics perfectly as well as their silhouette. I did not have a camera on my at the time, Sorry.